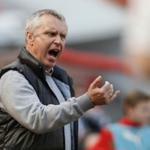 Head coach of football club «Lokomotiv» Leonid Kuchuk, to dismiss from the work with the team it was announced on the first day of the week, in fact continues to perform his duties. As said authorized Belarusian specialist Alexander Tolstikov, Tuesday Kucuk will arrive at the club’s base in suburban Bakovka, where he will hold another training session. Tuesday Kucuk came to office, «Locomotive», where he was to meet with the club President Olga Smorodskaya. Her coach was obliged to discuss his future in the team. The specialist did not give statements to the press, leaving it right Smorodskaya.